Mark Bolotin is an award-winning multimedia artist, inventor and technologist, as well as the founder of Synarcade Audio-Visuals and co-founder of the renown New York art technology company Hyphen Hub. Bolotin creates hybrid creatures and interactive multimedia work that fuse together theatre, film, music, puppetry and artificial intelligence technology in unique new ways. 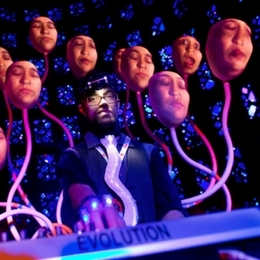 These interactive work include “Emergence: Build Your Own Being” (Sydney Opera House, 2007), in which audiences came together to create their ideal human being over four giant screens and then watch it come alive, and his current work “The Lumiphonic Creature Choir” in which a giant twelve-headed creature comes alive and begins to sing. Bolotin has created multimedia work across the world including at the New York Hall of Science, Museum of Modern Art (Zagreb), 3LD Art Technology Centre New York, Sydney Festival, SXSW (Texas), Museum of Contemporary Art (Sydney), Burning Man, Melbourne Arts House, and the Sydney Opera House. He was also the Arts Hub Co-Director for New York City’s inaugural Creative Tech Week 2015, a giant city-wide festival that involved over 800 leading tech artists and organisations including MOMA and the Met Museum.